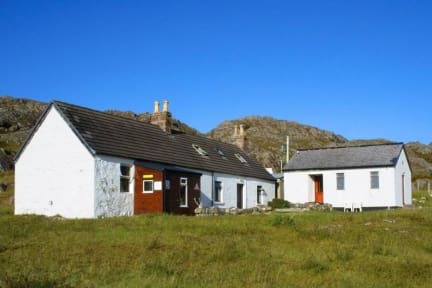 This small and friendly hostel provides a relaxing base to explore miles of unspoilt coastline and discover quiet secluded beaches, crystal clear waters and abundant wildlife. The hostel offers guests three comfortable private rooms and spacious shared accommodation with private lockers. Guests can enjoy a ‘Wee Breakfast’ of cereal, Scottish yogurt, fresh fruit, tea and coffee; or take advantage of the recently refurbished and well-equipped self-catering kitchen to prepare their own. Other facilities include a cosy dining area with wood burning stove, a laundry and small shop in reception selling basic provisions, soft drinks and snacks. There is no WiFi because of the hostel’s remote location. Free parking is available close by. 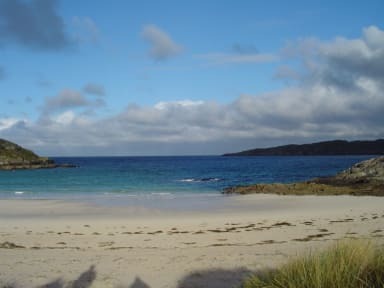 Dogs are welcome at Achmelvich Beach, for a small fee, when booking a private room. Please notify us in advance to ensure that there’s a dog friendly room available.